Thank you for giving me this opportunity to share some views on the ongoing negotiations under the Durban Platform. The decision on Durban Platform mandated that the new agreement shall be ‘under the Convention’. Therefore, the new agreement has to be in full accordance with all the principles and provisions of the Framework Convention. It cannot be in contravention with and cannot undermine the Convention. In Lima we are expected to agree on the information that Parties will provide when putting forth their INDCs. The INDCs are not distinct from the 2015 agreement, but inextricably linked with it. Therefore, the two cannot be seen in isolation from each other. As the title itself indicates, the INDCs are to be determined ‘nationally’ by Parties themselves, taking into account their own national circumstances, challenges and capacities. We believe that the developing country Parties will put forth their best efforts in accordance with their resources and capacity. Fulfillment of commitments and promises to provide enhanced financial and technological support for developing countries is crucial and will enable them to scale up their efforts and help in realizing our global goal. 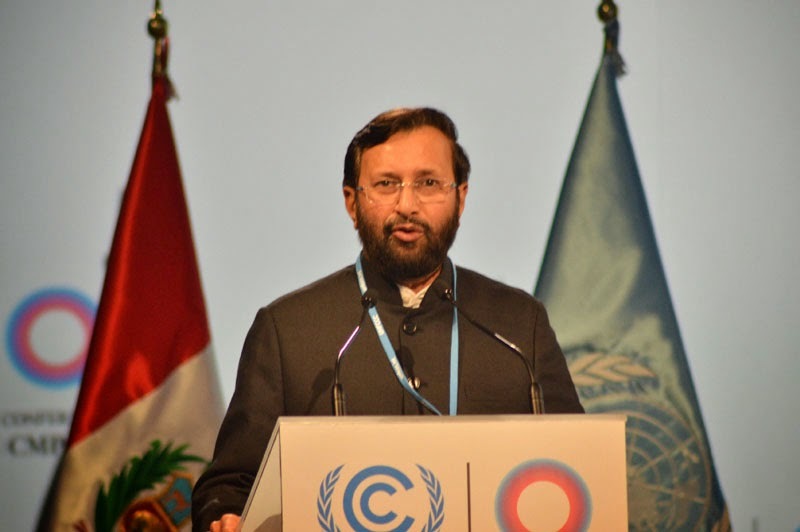 We in India are taking comprehensive action so that we make an ambitious and equitable contribution to the global fight against climate change. We support transparency and disclosure, but there is no role for any external review or assessment in this process. However, it is important to ensure that there is no slackening of the mitigation ambition of the developed country parties in the pre- and post-2020 period. Addressing climate change under ADP requires a holistic response with actions across a broad spectrum, including mitigation, adaptation, technology, capacity building, transparency and finance. Developing countries are allocating significant portions of their scarce national resources on adaptation, which remains an immediate and urgent global priority. In India for example, we estimate that investments required for adaptation would a significant portion of the national GDP. We therefore completely share the view of developing countries that the INDCs must not be limited to mitigation alone. The INDCs should be broad enough in scope to include all these elements. My negotiators have told me about a new phrase of ‘evolving CBDR’ that seems to have surfaced in their negotiations from certain quarters. There are other ideas floating as well. We also have our own ideas. But this is neither the right time nor the process to discuss these issues. The UNFCCC architecture has already evolved and this has been accepted universally. The developing country parties have voluntarily put in contributions in 2010. The 2013 decision on INDCs is another huge step forward. The need at this stage is to ensure that we have an ambitious, comprehensive, equitable and balanced agreement in 2015 that takes into account the huge development needs including access to financial resources and low carbon technological options for developing countries. Moreover, we are here to enhance the implementation of the Convention, certainly not to re-write it. Coming back to the negotiations regarding the elements of the 2015 agreement, where the textual negotiations have at last started. I must mention a ‘design challenge’ for the ADP work concerning the 2015 agreement for its negotiations next year. The work of ADP, including the agreement is to be informed by the 5th AR of IPCC, 2013-2015 Review and the work of subsidiary bodies. The outcomes of these processes would be available towards the latter part of next year. The ADP should consider and resolve this design problem preferably in Lima itself in order to fulfill the ADP mandate in this regard. India has been an active participant in these negotiations over the past two decades. We remain committed to working with all parties to develop a balanced and inclusive outcome in Paris to tackle comprehensively the challenge of climate change. We expect and are confident that under your leadership we would be able to evolve and successfully negotiate a text that is party driven and inclusive. Delivering the keynote address at the 2nd India – CLMV Business Conclave, here today, the Minister said that India-CLMV (Cambodia, Laos, Myanmar and Vietnam) trade was concentrated in only a few items and there was tremendous scope to deepen and widen the trade basket. The Minister mentioned that several sectors hold potential for trade and investment between India and the CLMV countries. These included skill development, agricultural products, manufacturing, project exports, energy among others. Smt. Sitharaman said that now “India’s Look East Policy has become very sharp focussed and it is “Act East” Policy.” She said that there is a need of “greater and accelerated engagement across the globe with East Asia.” The Minister stressed that “we are very keen to open up the north-east part of India; open up the economy, improve on its connectivity with the rest of the East and therefore look at India’s North-East as threshold to our Act East Policy.” The Minister said that “Commerce, Culture and Connectivity” are the three pillars of India’s engagement with the CLMV countries. Robust physical connectivity through road, rail and sea links will enable businesses on both sides to leverage the opportunities created by the India-ASEAN FTA in Goods. The FTA in Services and Investment will come into force with effect from 1st July, 2015. Seamless connectivity will spur people-to-people contacts and tourism, create new enterprises and millions of jobs for people in the region, especially when the economic corridors along the India-CLMV road and rail lines would be completely fully developed,” said the Minister. In his address, Shri Rajeev Kher, Commerce Secretary stated that India’s trade with the CLMV region amounted to USD 13 billion in 2013-14. Much of that trade, he observed, was with Vietnam. He felt that there was tremendous scope to expand trade relations with the other countries in the region. Mr. Kher highlighted the need to establish regional and sub-regional value chains in order to maintain and sustain long-term economic relationship with the region. 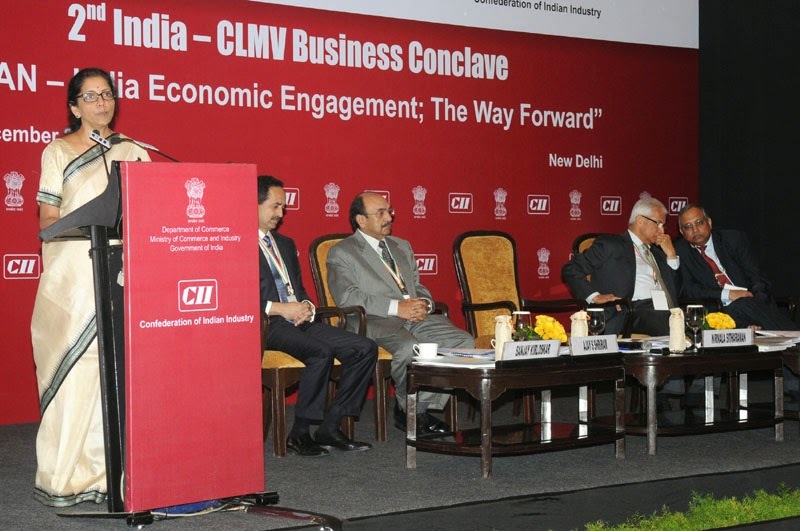 He stated that India industry could partner with businesses in the CLMV countries to reach out to newer markets. He felt that by joining forces, Indian and CLMV industry could take advantage of the trade agreement architecture that the CLMV countries have to access newer markets. In order to initiate a strong consumer protection regime and empower consumers against sub-standard goods, the government is working on stringent Consumer Laws encompassing a product liability clause to render erring manufacturers and suppliers liable to pay punitive damages; a move, which is slated to substantially overhaul existing consumer laws. Addressing the Members of Parliamentary Consultative Committee’s attached with his Ministry here today, Minister of Consumer Affairs, Food and Public Distribution, Shri Ram Vilas Paswan said that the Government has decided to give high priority to the protection of consumers and promotion of responsible consumer movement in the country as the post liberlisation and globalization has posed many challenges for protection of consumers. He expressed the concern over pendency of cases in consumer courts. He said the Government has plans to revamp the infrastructure and strengthen these courts. Briefing the members about Governments plans for consumer protection, he said that his Ministry has proposed amendments for Creation of a National Consumer Protection Authority to deal with misleading advertisements and for filing class action, online filing of complaints by the Consumers at the place of the residence, restriction of lawers appearance upto certain financial limits and Suo Motu cognizance by Consumer Fora. Participating in the discussion, Member of Parliaments said that to protect the interests of 125 crores consumers the Government should increase budget for consumer welfare activities. They welcomed the Government’s initiatives for the amendments in Consumer Protection Act and BIS Act.